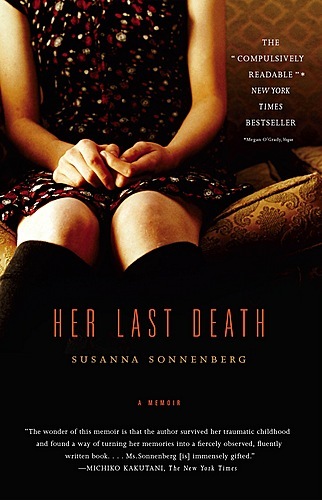 Having read about Susanna Sonnenberg’s latest memoir, She Matters, in a newspaper, my interest was piqued about not only this as a potential read, but also her first memoir, Her Last Death, the true story of a troubled (putting it mildly) childhood and the effects of which infiltrate adulthood. The honesty with which Sonnenberg arranges her words grasps the attention of the reader in much the same way an automobile accident may engage passing motorists. . . too horrific to comprehend, but impossible to turn away. Blushing while reading one passage, empathizing while reading another, this is definitely a page turner. Feeling as if I now know the Susanna on these pages, I yearn to know the rest. What has happened between the final page until now? For the purposes of book club, many gourmet delicacies are discussed throughout. However, a defining moment in the memoir comes when Susanna realizes she favors her eggs scrambled, not a soft scramble, but hard. Thus, a brunch with the eggs in question would be a compelling conversation starter.